Boynton Beach Dentist: Maury S.
Maury S., is 65 year old disabled male who lives locally. He was previously a Materials Technician by vocation. 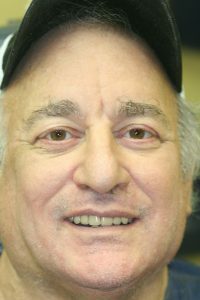 As his life progressed, however, he found himself in worsening financial position and progressing health and mental disorder including a debilitating kidney disease as well as Bi-polar Disorder. Included with his physical health issues, his dentition also suffered from a lack of care. He lacked the finances to repair and maintain his dentition. With his dentition in disrepair, his concept of himself also was effected and he became more depressed. Moreover, he wasn’t able to eat a diet that would foster controlling his diabetes. 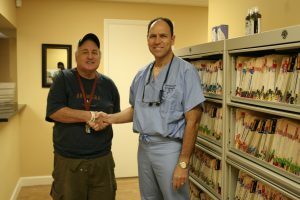 However, through social services, with the help of affiliated Dentists and Dental Laboratories, Donated Dental Services under the auspices of the Florida Board of Dentistry, Maury, was able to get his dentition rehabilitated. It was our pleasure to assist Maury, at this time. We at East Boynton Dental wish him well and hope that the changes we gave him will also change his perspective and outlook on life. We know we gave Maury, something to smile about! 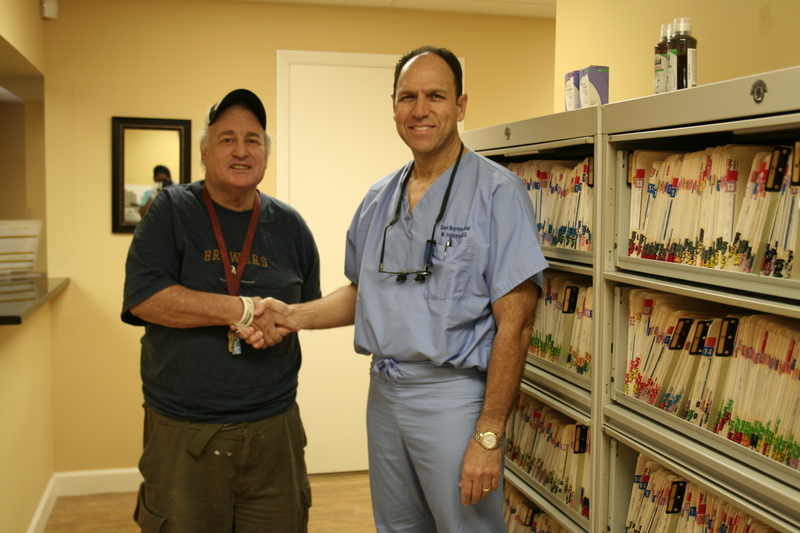 Boynton Beach Dentist: Bank Financial Advisor Wanting To Invest In His Smile. Christopher F., is a 58 year old Financial Advisor with a large local bank. Personal appearance and presentation is very important to a man that works one to one with clients. His teeth are in good condition. However, he has a predilection for chipping the upper incisors. 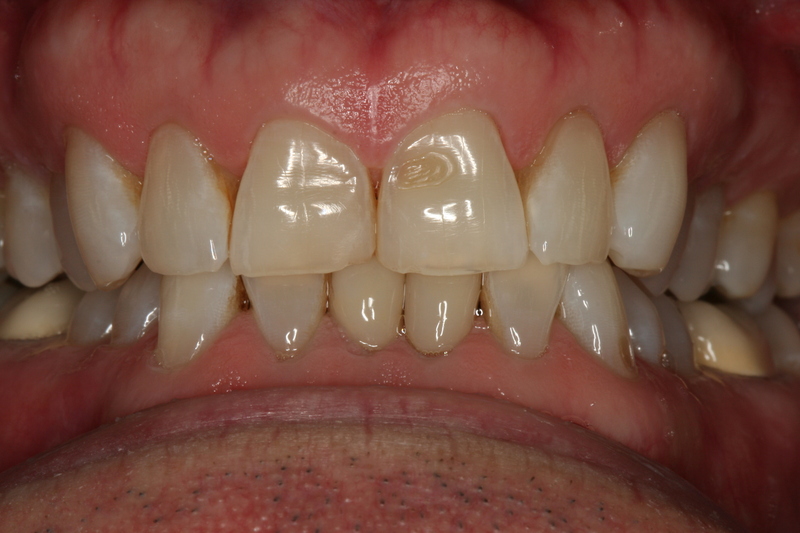 They had been repaired with direct fill composite resin bonding material two times in a four year span. Also the front surface of the incisor teeth are developmentally concave in shape. 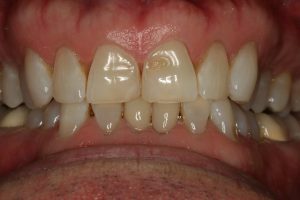 After reviewing the patient’s teeth clinically and radiographically, it was felt that the best course of action was a treatment plan that included the two central incisors alone, since the other contiguous teeth were in good repair. 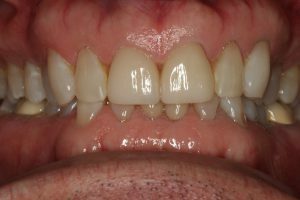 Images of the patient’s teeth prior to treatment are below. An impression was taken of the patient’s dental archs. The models retrieved from the impressions were sent to the laboratory for evaluation and “wax-up”. The “waxed up” version was returned from the laboratory and then shown to the patient and after review the patient accepted the treatment plan. In doing so the patient got an opportunity to see a three dimensional version of what the final case should look like before a bur or any changes are made to his dentition. With the patient’s approval and consent, treatment then commenced and the central incisors were prepared slightly. Definitive impressions were taken of the prepared teeth. The patient’s teeth were temporized. The model of the upper arch of teeth with the two front teeth slightly prepared were retrieved from the impression. The laboratory then fabricated Porcelain Veneers for the two front teeth. 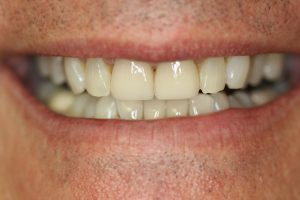 Approximately two weeks later, the temporary material was removed from the patient’s central incisors and the new Porcelain Veneers, now fabricated and back from the laboratory, were then tried in. After the patient’s review and acceptance, the Porcelain Veneers were cemented in place. 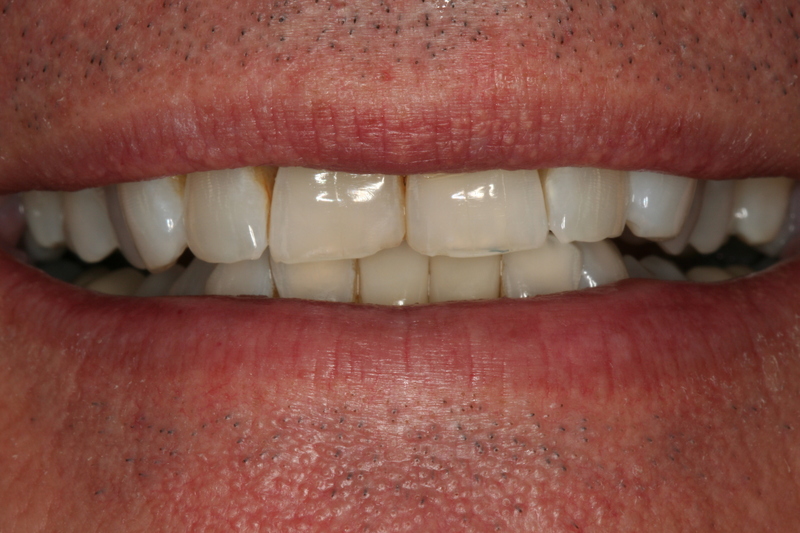 The images below reflect the final finished case with new Porcelain Veneers in place. If you would like to discuss the treatment in this case or any other case listed in the please feel free to contact us at eastboyntondental.com. We would be more that happy to talk to you.